After all the Oscar winners received their awards on Sunday night, they were ushered backstage where they took questions from the press. The questions were mostly about the films, their work and the occasion. The Wrap reported that there was a brief moment of controversy as someone tried to ask Natalie Portman about the scandal around John Galliano's alleged anti-Semitic rants and why she as a Dior spokesperson was not wearing a Dior dress. But an Academy official stopped her before she could respond and told everyone, "We're just going to move on." 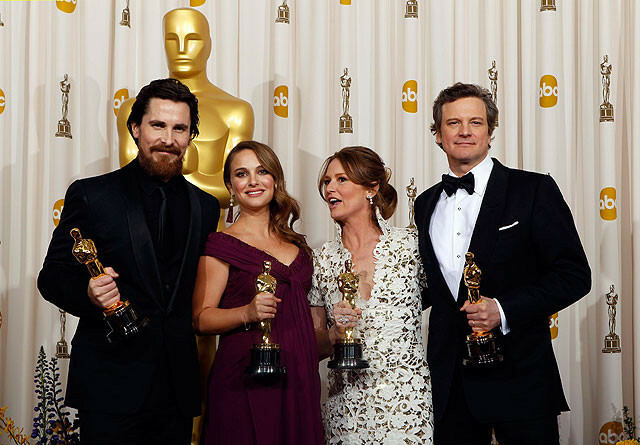 Anyhow, here is a selection of the best backstage quotes by Oscar winners on Sunday night. Q. I hear you put the emphasis on "my union crew." A. I did, I did. I think what's going on in Wisconsin is kind of madness right now. I've been a union member for 30 years and what the union has given to me is security for my family; they've given me healthcare in a country that otherwise does not provide healthcare. And I think the unions are a very important part of the middle class of America. So I stand strong behind any of the union members in this country and any other country because all we're trying to do is get a decent wage and have medical care. Thank you, guys. Q. I wanted you to win for FROZEN WINTER so it's awesome to see you back here. And I applaud you for taking your character from the movie on stage, dropping what I think is the first ever F bomb in the Oscars. How does that feel? A. I had no idea. Those words, I apologize to anyone that they offend. There's a great deal of the English language that is in my vernacular. Q. I thought it was wonderful. A. I really don't mean to offend, and probably a very inappropriate place to use that particular word in particular. Q. What was it like for you when Kirk Douglas kept stretching and stretching and stretching? A. You know, it's really funny, you know, because he's an old actor. If anybody is an actor, he's an actor, right? And actually, he was doing us all this huge favor, because the longer he strung it out, the calmer I got to be. I got to take more than one glance over at Amy, who was sitting just in front of me away from where he was, I wanted to watch him because he was delightful to watch and I wanted to peek at Amy, so he strung it out in a rather delightful way for me and actually allowed a heart rate that had gotten fairly high as the category was announced to settle a little bit and wait and see what the envelope said. Q. Melissa, AFP. I was wondering if you felt vindicated about the campaign now that you've won? A. There's nothing to vindicate, and there was no campaign. It was a photograph in a magazine; I wanted a pretty photograph in a magazine, that's all it was. Q. Do you have any words for Mark Zuckerberg or about Mark Zuckerberg and maybe want to mention the Middle East too or maybe not? A. Okay. Yeah, you have to talk with somebody a lot smarter than I am about the Middle East. As for Mark, I think he's I don't mean to diminish anything, I think he's been an awfully good sport about this. You know, I don't think there's anybody here who would want a movie made about things they did when they were 19 years old. And if that movie absolutely positively had to be made, you would want it made only from your point of view, and you wouldn't want to include also the points of view of people who have sued you for hundreds of millions of dollars and, you know, had a visceral emotional reaction to you. But that is the movie that we made. And you know, with things like Mark's appearance on SNL, the fact that he took his whole staff to see the movie the day that it came out in the US on October 1st and, however it might be related, his hundred million dollar gift to the Newark Public School District which was met with some cynicism in the press because it was felt that it was a move to deflect criticism, I'm sure that the kids in Newark and their parents and their teachers don't care how the money got there. So, my hat's off to Mark. Q. I understand that you've developed a friendship with David Seidler over the course of the awards season. Can you talk about sort of the emails that you've been exchanging and that friendship? A. I'm proud to say I've got a romance going with David. I think that his screenplay for THE KING'S SPEECH is remarkable. I think the whole movie is remarkable. I couldn't be a bigger fan of the movie or of David. And I think it started when I asked around and I got his email address after I saw the movie because I had to write and tell him how much I loved him. I'd never met him before I had any interaction with him. He emailed back and we began emailing each other every few days. You know, once Thanksgiving hits, if you have a movie that's in the conversation, you're kind of going to some kind of award show every Saturday or Sunday night. So we would see each other either here or London. And I've grown to love him very much. Q. After writing a very important political TV show for America and then seeing what's happened in Egypt and going on in Libya, what were your first thoughts when all of this took off after this movie had come out? A. Do you mean that the revolution in Cairo, that Facebook was an important tool for that? A. Yeah, I thought it was an incredible thing and listen, I'm somebody who has written a lot and talked a little bit about, I've been cranky about the Internet. Somewhere along the way I've turned into my grandfather and I've been cranky about the Internet and I've got some good reasons to, but when you see what happened in Cairo and there have been other examples of that, Jena Six Jena Six, not five, right Jena Six, and there have been other examples of social networking tools mobilizing people for great causes like that. Again, you really want to thank the Mark Zuckerbergs that are out there for doing it. Q. You said you felt this movie has now given stammerers a voice around the world. Talk to me a little bit more about that. Why do you think that is? A. Well, I don't want to give away privileged information, but you know, a fairly high ranking person called me the other day and wanted to talk ex stutterer to ex stutterer and expressed their guilt at the fact that for so many years they stayed in the closet because they felt it would hurt their career to be known as an ex stutterer because people still have the archaic notion that we stutterers are feeble minded simply because it is difficult to articulate our thoughts. And the fact that this film has come out has given so many people the courage to talk about their stuttering, and I've been flooded with the most wonderful e mails, phone calls, text messages from my fellow stutterers because I'm still a stutterer, all right. I know all the tricks; you don't hear it. I don't even have to think about it anymore, but I am still a stutterer. But to have these people tell me their personal stories, really moves me to tears. I'll give you one example. A speech therapist spoke to me just a few days ago, that one of her clients, a teenage girl, had come in and having been terribly bullied for being a stutterer, and what do most of these stutterers do when we're bullied, we keep quiet because how can we talk back? That's the very thing they tease us about. But this girl was determined not to take it. And the therapist said, "What made the difference? Normally, you just remain passive." And she said, "Because I have a voice. Q. Congratulations, sir. Sergeant Connors, Armed Forces Network. One of the themes that I saw in the movie was leadership during war, King George VI was thrust into a position that he didn't necessarily expect. What is your advice from exploring the subject that you would have today for leaders in these wars who are in situations they may not have been prepared for? A. Absolutely. I'm sure in your uniform, you know all about suddenly having to take up leadership when you least expect it, which is what happened to Bertie. One of the themes of the film is the social contract, by which I mean with privilege and position and wealth comes responsibility and duty, and Bertie really understood that. His brother did not. But Bertie was a man who was not meant to be king, he didn't think he would be king; he wasn't really suited to be king. He had a speech impediment and he was a fragile man. But when his brother let the nation down, he knew it was his duty to try to make up for this. And it's very interesting that at the ascension council when he first took over before his coronation he very humbly said, I'm paraphrasing now, I'm going to try my best to make up for all of this and do my job well, and he did. He bellied up to the bar and he delivered, just the way you guys do. Q. You mentioned earlier when you worked with the Queen Mother at the beginning of this process 30 odd years ago, and you didn't start the movie until she passed, have you had any other further contact with the palace, with the Queen's office, with Prince Charles about the movie, and have they seen it? A. Well, I don't know that directly because I was not in the palace, but we have certainly heard, and it has not been denied and it could easily be denied, that Her Majesty has seen the film. We are told that she was moved and amused. I am deeply moved by that, and I am very gratified that if this is true, she clearly understood that this was written and made with a great deal of love, affection and respect for her father. And as I said in my speech, I'm awfully glad she didn't send me to the tower of London for putting the F word into her father's mouth. Q. You were saying that the other movies were great, the other movies in the category. What else can you say about them? Was there anything in particular that you thought, "Okay, that's going to win"? A. You know, actually, I mean, this might sound weird but I actually hadn't really been thinking about, "This one is going to win." You know, the thing is as a filmmaker, you are naturally interested in good movies and you're naturally interested in movies that have a real impact on you, and all the foreign movies had an impact on me. And it's an interesting thing with this category because you kind of feel like you're colleagues, and you feel incredibly sort of provoked or whatever about the movie. And of course I want to win but you're also intrigued by the story that's happening. Q. Every intense part of the play and every intense experience you have teaches you something about yourself, this campaign or whatever you want to call it, up to the Oscars you've been maybe more personal than any of us have ever seen you before. What has this intense experience taught you about yourself? A. It's just a genuine thing, you know, I'm so flattered when anybody, any person, you know, any one person who walks up to me and says that they were really touched by a performance, I really adore that. I really love hearing that, you know. I mean, what we do becomes so much bigger than ourselves and I appreciate that so much. And I've been in China. I just got back the day before yesterday, I've not been a part of any of the campaign that's been going on. And just to get back and then hear people tell me how much it means is just wonderful. That's what you're hoping for. And the only thing, you know, I want to say is that obviously the nominees who were nominated for Best Supporting Actor are just phenomenal actors and incredible. But equally, there's so many other actors out there who would deserve being up here as well, you know. They're saying I love motorcycle racing, and I was watching something this morning, and it's like, hey, that comes down to who's first up to the line, who was the fastest. This has nothing to do with that. It's not who's on pole position, well, that guy decided to go backwards, that guy decided to go back in the stand and drink a Slurpee. That guy went forward. It's all like, what do you think, you know. What I mean, it's all just a matter of opinion and so abstract. This is a very bizarre thing. But at the same time, I just can't help but be touched so dearly by it. You know, people, so many inspirational, talented people decided that I was worthy of this. I just treasure this. Q. I was just wondering, this isn't the first time that you've lost a lot of weight for a role. You did it for RESCUE DAWN. When you accepted to take this role, did you think twice about accepting it because of the physical sacrifice you had to do, and is there any sort of thing that you wouldn't do to yourself physically at this point in your career? A. I just like the character and it wasn't till a little bit later I said, oh, he's a welterweight, he's a crack head. How many fat crack heads do you see? Then I realized, that's what I have to do. So it came later just by that point, you know, like I always say, I saw something and this has always been I didn't really ever take acting classes. I didn't go to drama school or anything. I always feel like I'm having to make up for that while other people know where they're going really and I'm just sort of winging it. I saw something one time, it was Jimi Hendrix, and I just adore the guy's talent and just raw ability to just communicate through his guitar and I saw something about his fingers just bleeding, just blood dripping off of the strings and I always went, that's it, that's it. You know, that inspires me to no end. So whatever it takes, I feel like I'll do for a movie. But the thing is, a lot of people see it as a gimmick, and it's not a gimmick. You know, they say, hey, give a quiet performance, and you can give a quiet performance and lose a lot of weight. Do you know how much it takes do that? So if it's necessary, I'll do it, you know. I'm getting a little bit older now. I'm starting to recognize if I do too much, there may be no coming back from it. I don't have quite that same mentality which I did only a few years back, where I felt I was invincible and it didn't matter what I did. I was coming through. You know, I have a child now. I just want to really be smart about any other body alterations that I make in the future. I know that too many of them just, you know, there's only so much your body can take. I'm happy that I've done what I've done. Who knows. Maybe that will be the last of it. I've said that a few times before. Q. You said David Fincher gave you specific direction or really knew what you wanted; was there kind of an overwhelming or over arching theme he had for you guys? A. [Reznor] Well, we had read the script and David called us in and said, the only immediate direction was, "I don't want to use an orchestra. I would like it to feel kind of electronic." He referenced a couple films. BLADE RUNNER was one of them. Not to sound like BLADE RUNNER, but to inhabit the to have a score that felt like the same iconic quality that the music BLADE RUNNER had in its time. Not something that sounds like that or sounds dated like, but might today. And the thing with David though, and I think this is where we we hit the mark right from the start, is David is never making things up on the fly. And it was difficult at first for us to see a film or read a film and read a script that was a bunch of people talking in rooms. It was no great sweeping landscapes or battle scenes or anything like that and it wasn't obvious to us what flavor or kind of shape the music was going to have. And knowing that David what I am trying to say here is David had a very I knew he had an idea of what would make this picture special and that kind of rested on the music. We just generated blindly with no picture. We wrote almost two hours worth of music, just to give him, say, "Hey, it feels to us like the emotional temperature of this film," and what could be interesting and a little darker than I thought he was going to react to it. And that became 90 percent of what you heard in the picture, so. Q. I think you somewhat just answered my question, but when you first got the script, when you heard about the subject of the movie, were you a little bit nervous thinking, "Oh, this is very dry, how am I going to do this?" A. [Ross] I remember the trip back from David's the first time we saw the rough cut, it was probably more we watched about 45 minutes. And there was more dialog in that than in the last ten films that he did, combined. And we were just it was a quiet car ride home. A. [Reznor] And really, it came down to the pedigree of Aaron Sorkin and David Fincher is what attracted us, just the idea of scoring the film of the founding of Facebook doesn't sound like a great idea, doesn't sound like a great film. When we read the script, we knew this is a very smart and very intelligently written film; how can we make it, how can we make it feel kind of human and not just what could be unlikable people jousting verbally, you know. Q. You know, we hear year upon year of the pressure to get these below the line awards off of the tech cast and say that people aren't interested, but INCEPTION is winning a bunch of below the line awards and it's wildly successful. I'm wondering if you can talk a little bit about your work and the work of the other below the line artists means to audiences. A. Well, these are not technical categories, they're artistic categories, every one of them. You know, I barely know how to boot a computer up without assistance, so I'm telling you that it's we're hired for the quality of our ideas. Every category, and not our ability to operate a piece of machinery, so it's it's about coming up with the ideas that will contribute to what Chris Nolan wants to put on the screen and create as the film and, you know, we then scurry around trying to figure out technically how to accommodate those creative challenges, but it's it's art direction, visual effects, sound, are absolutely creative categories, not technical categories. Q. I do have to ask the question specifically to Rick Baker because I just recently interviewed Adrien Morot from Montreal who was up for BARNEY'S VERSION, and he thought he was not going to win tonight because he said the "Chosen One" was up for the Oscar, and he meant that in the greatest possible way because he feels you are an inspiration to other makeup artists in the industry. And I am curious now that your hair is white like mine and so we're, you know, we're at that stage in our lives, what that means to you to be somebody who's inspirational to others, including folks like Maestro and Adrien Morot in Montreal? A. [Baker] It's really great. I mean, it's nice to I like to have my work inspire somebody. And there's so many makeup artists that are working in the screen now that say that to me, that my work inspired them to get into the business. And it's just as Jack Pierce's work inspired me to get into the business. So, it's great. And I thought I was really Dave and I both felt that this year, you know, if we didn't win, that both of the films we were up against, we wouldn't mind losing to because I thought they all did just a really terrific job and are really fine makeup artists. So, we were in good company. Q. I'm just curious, did you get any reaction on the carpet on your way in from other people who were here tonight that have seen the film? Did anybody talk to you about that? A. I think a couple random people recognized me who happened to see the short but, yeah, no, there was not much attention on the red carpet for our team, but it was really fun. We were basically kind of standing behind Robert Downey, Jr., just to get on TV. Q. Is there anyone new you are excited to meet when you're going upstairs to the Governor's Ball? A. It was interesting to me at the Nominees' Luncheon was a little while ago, it's funny, when you're in a room and there's like one famous person, it's like very distracting, you keep looking at that person, but the Nominees' Luncheon, there was like wall to wall famous people, so you sort of click in this other level of reality where it's like existing in TV or real life. Actually, the screenwriter of TOY STORY 3 and of LITTLE MISS SUNSHINE came up to me at the Nominees' Luncheon and said he was a fan of the movie, "We like your story." That was sort of my famous person story. Q. Congratulations to you both. Terrific movie. Why do you think nothing has been done about this? A. [Ferguson] Unfortunately, I think that the reason is predominately that the financial industry has become so politically powerful that it is able to inhibit the normal processes of justice and law enforcement. And I am sure also that personal decisions were made by President Obama and high level members of the administration about this question as well. Q. Do you think anything will ever be done? A. [Ferguson] I think that something will be done, if and only if, the American people get angry enough. Q. I'm sure you've answered this question a couple times. What happened along the way making this film? Did you get any threats? Did you were there situations that you stepped into that you expected possibly or not expected? A. [Ferguson] We did not receive any threats. There were some surprises. I would say that the biggest surprise to me personally and biggest disappointment was that nobody in the Obama Administration would speak with me, even off the record, including people that I had known for many, many years. A. Who would want to break into it? It's like a bank that's already been robbed. A. It's over. But go on. Q. So, how practical do you think it is for college kids to actually major in music? Do you think they should just maybe major in business or something practical and realistic and just do music on the side? A. No. Keep doing it. If you stayed in it that long, you must love it. I am the only person I ever heard of that just never loved it but just kept going because I was sort of good at it in some ways. But, I mean, you keep doing it. The Juilliard graduates, 50 percent of them or more don't go into music, and that's as high as you can go in promising musical people. It's a really tough living to make, but, no, you shouldn't. If you love it, do it and see what happens. It's not going to hurt you. It's a very complicated thing. You can study it for the rest of your life and to your benefit. It's not a vocational school, USC, you know, really. It's a great music school. Q. Hi, Tom. What does mom think you should do next? A. That's a very good question. She's under a little bit of pressure now for the magic of the next Oscar winning picture, but I'm not sure she's going to achieve it for a while. She hasn't been invited to another free play reading. So, that's something I'm hoping is going to happen soon. Q. Actually my question leads from the last one. I was enchanted by the story of your mom in finding a play, but it also reminds me of this whimsical nature of finding film projects, and I am wondering if you could talk to that a moment because you are in the film industry that's, you know, that's always going through people with difficulties getting their films seen, but here you are in this triumphant night. So I am curious if you could expand on the whimsical nature of finding these gemstones. A. I think I didn't quite believe that there were masterpieces sitting unread in attics. I kind of thought the system worked; that there were scouts everywhere was sufficient. If someone wrote a good script, people would know that it existed. And the story of how this film came to be is a classic example of how that's not the case. I mean, this play it was a play reading, but this play failed to be produced. I mean this play was going nowhere when, you know, I came to it and when my producers came to it and Geoffrey came to it. And so it's maybe more open minded to the idea that there may be masterpieces or wonderful stories that lie neglected, and the system doesn't always necessary deliver to you the best stuff that's out there. Q. Both David and Colin had both expressed tonight how they have gotten e mails and calls and letters from people who have been transformed by this film, and I am just wondering what has been your what has been the reaction to it on a personal level to you? A. I mean, I'm continually astonished by the, you know, the personal stories I encounter of how this film has changed people from a woman I met at a London screening, who saw it three times and had a late who had a brain aneurysm, from a late onset stammerer in middle age and saying how grateful she was to the movie to a friend of mine, who actually, after coming through a screening of KING'S SPEECH and seeing the film seeing the scene where it talks about the about not being letting go of letting go of the father's expectations. This friend of mine actually started to come out after THE KING'S SPEECH because he realized he was trying to live up to his father and not look after himself, and that scene inspired him to be someone he'd never been before, to a woman I met yesterday, who had seen the film six times and said she had been praying that it goes home with an Oscar. So, it does seem to touch people in the most extraordinary way across the age range from nine to 90, across cultures, across all sorts of boundaries, and seems to have this extraordinary democratic reach, which is you know, and I made films I hope people want to see, and the greatest reward is being that something that was so personal to me that I wasn't making for, you know I wasn't trying to make a blockbuster. I was just trying to make something personal and from my heart. The fact that's connected in an extraordinary democratic way is very touching. Q. A great night in all the above line categories, obviously, and again, congratulations. Bit of a shout out in the below the line categories. Can you talk about some of the contributions your department heads in areas like cinematography and production design? A. I'm pleased you asked that. I'm standing here on the shoulders of an extraordinary team and some of whom are long term collaborators, Danny Cohen, my director of photography, did JOHN ADAMS, did LONGFORD, and the way he photographed this movie I thought is integral to telling something that could have been a series of talking heads into something that was acknowledged as cinematic. Eve Stewart, I mean the wall in the consulting room which has now become famous. The very first day of preproduction, she said, I am going to take you to Logue's consulting room. I'm in London, and I recognize London inside out. I had no idea this place existed, and she led me to this real house and showed me this room, and I knew we had the movie when I saw that room. So her contributions have been immense. Tariq Anwar, my brilliant editor, who cut AMERICAN BEAUTY, THE MADNESS OF KING GEORGE, among many other great films. It was his idea to choose Beethoven's Seventh, all the classical musical choices are his, and I think this film is so much about the way it's edited, it's understated, but it's very clean and Jenny Beavan, costumes, and Frances Hannon on makeup, and you know, I think I was very blessed with an extraordinary team and I am very, very aware that this award is really an honor to them. Q. Congratulations. A couple people have already asked you questions about your mom. But I am wondering when your mom first came to you with the idea for the movie, did you love it right away? Were you a little skeptical? A. I am very embarrassed to admit that I did not read it. So, you know, I think I was directing JOHN ADAMS, so I was in LA, and I was legitimately busy, post producing nine hours of JOHN ADAMS. I was trying to get it out for March. And so, not only did she find it, she also reminded me every two weeks for about three or four months that I really should read it, and thank God, I did because when I read it I rang her up and said sorry it's taken me so long; yes, it is my next movie. Q. So your movie has many different interpretations of the meaning. What's your interpretation? A. Well, I think that one of the most beautiful things about the film is that it can be interpreted in so many different ways. I really see it as this young woman's coming of age and that she becomes a woman. She starts out a girl and becomes a woman by finding her own artistic voice and sort of killing the child's version of herself. She becomes a woman. So I don't see it necessarily as a death at the end like many people do. A. You know, when I was working it was really so it was so hectic. We were just working such long days and sleeping five hours a night and then just starting a day again, and there was so much preparation and so much training that I didn't really necessarily have time to think about what was happening. And dream wise, I was just so exhausted every day, I was literally just like falling into bed and waking up and going back to set. And I think that sort of pace actually helped me stay so focused for the part. I didn't have too many crazy dreams. I'm pretty good at shutting off. This one was a little harder to shake. I think just the whole mood of the whole movie was so intense, it stayed with me a little longer than usual. A. Absolutely. Darren, I think it's only possible to give yourself so freely when you absolutely 100 percent trust the person you're working with as your director, because they are responsible for everything. In film it is absolutely a director's medium and you are completely subject to their artistry, and Darren's artistry is so extreme that I really felt free to try anything. And Benjamin similarly. You know, I think to be believable as a dancer, I just trusted in him fully to be honest with me, to choreograph in a manner that best flattered what I could do and best avoided what I couldn't do, and really was catered to making it believable. And he was absolutely the key to credibility for the film, and that was fully on his shoulders. Q. One of the reasons THE KING'S SPEECH actually got made in the first place is that it got a 1 million pound grant from the UK Film Council. That Film Council has obviously just been scrapped by the incoming government. What do you think your success tonight and the success of the film says about that decision? A. I don't really want to get entangled in the political judgment on that. I tend to find that my rather insignificant opinions get more attention than they deserve, but I do think that on the face of it, that that was a short sighted decision. I do however think that the fact that the BFI seems to have taken up that role is very positive and I think that it was probably a sign that the government has recognized a need for a body like that, that they need to work closely with to find a way to get films financed with government cooperation. So I'm optimistic at the moment. Q. Colin, I'd like to ask you, we talked to the man who wrote the screenplay. We've seen this movie. What message do you think this story sends to people? A. I don't believe in messages in what I do. I don't think we're preachers. I don't think we're philosophers. I personally happen to be an annoyingly outspoken person, but that's not because I think the storytelling involves prescribing what people should think or hear, so I'm not in that business. What has struck me is the emotional response to it seems to be very, very personal. It's quite diverse. Quite obviously speech therapists and people who have difficulties with their speech of whatever kind, have responded to it, and that is very powerful to me to be on the receiving end of that kind of feedback because what we do is very often, it's justifiably judged as completely and utterly frivolous. I think frivolity is also very important. That's a whole other argument. But the fact is that it overlaps with something that has connected with or resonated with people who've, you know, feel they've been heard about something for the first time. It's probably the most valuable thing of all to me. I don't think it sent a message. I just think maybe it shines a light on something which badly needed it. Q. I was wondering what you think of the new PG13 cut of the film? Q. That's what I hear, but I hear that they'll be screening it tomorrow, or some people are screening it tomorrow. A. I don't support it. Q. Why do you not support it? A. Because I think the film has its integrity as it stands. I think that scene belongs where it is. I think it serves a purpose. I'm not someone who is casual about that kind of language. I don't relish I take my children to see football games, soccer. And I wouldn't be able to, if I wanted to protect them from those kind of words at the expense of all else. I hate hearing that language around them, but I'm not going to deny them an experience of a live game. You know, it does distress me to, you know, to hear that language bawled in the ears of my kids. So I don't take that stuff lightly. But the context of this film could not be more edifying, more appropriate. It's not vicious. It's not to do insult or it's not in any of the context which might offend people, really. It's about a man trying to free himself through the use of forbidden words, and he's so coy about it. I mean, I just can't I still haven't met the person who would object to it. So I think the film should stand as it is. Q. Listen, when we talked about this early on, you were very good about noticing how the director and the choice of lenses, the way he placed you in the frame helped you create the feeling of isolation that you got? Q. Would you like to take an opportunity to mention that again? A. Yes. In some ways, the way of working was conducive to the kind of tension and anxiety that I needed to draw from for it. The very first thing that Tom shot on me was a single shot of me in the first scene where Bertie meets Logue. That's kind of baptism by fire in a story like this. Normally, you would kick off with something easy like walking down a corridor or getting out of a car and then the crew will get to know each other and once we're all safely in the zone, then you can start to get into the more serious stuff, and then you might eventually start with a wide master shot with two actors, three actors. And you'll know that that you're establishing the scene first, the critical stuff. The stuff on your face, most of that, is not going to play on this shot. So you get a chance, it's like a rehearsal. Tom didn't do any of that. He decided to take a ten minute scene which was basically a three act play and said kick off on my face. And there is nothing for it but to commit. And I think he made a very, very good decision, not just for me, but for him, where we thought, "Okay, you know, you don't have much time in film, I think, has a misperception that you try and try again until you get it right and you can keep doing it." That's not how it works. You get three goes, four. It's expensive. You know, it goes into the can and you move on. It doesn't matter if you haven't really nailed it. This is like a feeling of being pushed out in the royal upper house and told to sing on the first night without much rehearsal and you just have to dig for whatever you can. And then, I think it was very good because I put both feet in and so did he and he committed to a style he wasn't quite sure about yet. He still had a few options open, but after we completed that day which could have ended up being about ten percent of our entire film, he realized he had committed to a cinematographic style. And I had committed to my approach and to be squeezed down in the corner of a sofa and Tom kept telling me to shrink myself physically because I'm much bigger than George VI. He was very slight and he had a famous small disposition. So Tom's note to me was, "Try to disappear as much as possible." And I think that's partly why he put me on the edge of the big sofa and part of why he put me on the edge of the frame, surrounded me by what he thought was negative space. And I could feel all that going on and so it definitely informed what I did. Q. So with such a close race this year, how were you feeling before your name was announced? A. I think we were incredibly nervous all the way through. Obviously when Tom Hooper won the directing award, that increased our nerves because it was looking more likely. Q. You made it to the finish line, congratulations. I'm curious, I mean, this whole awards season is such a long marathon, and I mean early on when some of the earlier awards didn't go your way, I'm just curious, did you guys lose any hope or did you know you had something special here? A. I think we always, from the point where we invested in the project from its inception, from the point in the script we had faith in the story and David Seidler's telling of it, and these campaigns run and they peak and they trough, but we never lost any faith in the film that we have. A. We're constantly stunned every Friday or Thursday or Wednesday when they released THE KING'S SPEECH, we didn't think it was necessarily it wasn't something they necessarily connected to. Because they did, we were all buoyed by the fact that the audiences were watching the films. Q. Do you have anything to say about Harvey and his support of the film and the way he manages it? A. Yeah. I mean, there's no doubt we wouldn't have been here without Harvey Weinstein. He did an absolutely amazing release of his film. The timing of the release was perfect, working with the campaign, and we owe him a huge amount. The film has worked incredibly well in America. It's worked all around the world, but this awards season has been driven hugely by Harvey Weinstein, we know that. Q. You have been around the world, as you say, with very personal stories and awards and people telling you what this meant to them. The Academy Award seems to be the most important award of all. Can each of you tell me in the most personal way how it affects you to win the Academy Award? A. I'll start with that. It's the most amazing honor that we could ever imagine. I mean, there's been incredible things that have happened throughout this film. The support and the response that we've had from the stammering and stuttering community, being able to tell David Seidler's story is incredible as well. But to be honored in this way by our heroes, as much as anything through the Academy Awards, that has not sunk in yet, probably will be by April. A. The buildup of this award is I think like none of the others, and obviously it's the final award of the season, and there's just something about it that left us absolutely speechless, in a sense, and to have won this award, I don't think there's anywhere else we can go. That's clearly the most extraordinary moment in our lives. A. For me the really amazing thing was receiving the award from Steven Spielberg. I almost forgot I won an Oscar. I was more shaking his hand, and if I can, picking this fellow up. The biggest thing, the award, apart from the success of the film in terms of box office is, as Iain said, just the letters and the comments and the support and love that we've had, not just from stammerers, but anybody with difficulties in their lives that can embrace a film like ours and (inaudible) friendship, but there always remains hope back, and that gives us hope for our future projects.